On most days, most orders received prior to 4:00pm are packaged and shipped out same-day providing item(s) ordered are listed as in-stock. Use the following guidelines when deciding whether to select UPS (United Parcel Services) or USPS (US Postal Services) when choosing which carrier to use. If you are in the Minneapolis/St. Paul MN area, you may also elect to PICKUP your package. We ship to all US States, Canada, and various other countries. Shipping options and estimated times below are only shown for US and Canada destinations. ** - Only qualifying USPS Express Mail Locations are guaranteed "Next Day" delivery providing order received by specified time. Express Mail packages flow into the USPS Sorting system at 5:30pm Monday through Friday. Prices for all UPS shipments include detailed tracking and delivery confirmation service. UPS shipments are guaranteed to be delivered on-time. Please see UPS's terms and exceptions for this guarantee. UPS may, at its own discretion, may require a package be signed for prior to its release. UPS can NOT deliver to PO Box numbers. Package will arrive by 8:00 or 9:00am, on the NEXT business day. Packages shipped on Friday will arrive on Monday (except when Friday or Monday is an observed holiday). See conditions and terms for this service. Package will arrive by 10:30am, noon, or end of day depending on destination, on the NEXT business day. Packages shipped on Friday will arrive on Monday (except when Friday or Monday is an observed holiday). Package will arrive by 3:00 or 4:30, on the NEXT business day. Packages shipped on Friday will arrive on Monday (except when Friday or Monday is an observed holiday). Package will arrive by 10:30am or noon, on the 2nd business day. Packages shipped on Friday will arrive on Tuesday (except when Friday or Monday is an observed holiday). Package will arrive by end of day, on the 2nd business day. Packages shipped on Friday will arrive on Tuesday (except when Friday or Monday is an observed holiday). Package will arrive by end of day, on the 3rd business day. Packages shipped on Friday will arrive on Wednesday (except when Friday or Monday is an observed holiday). Package MAY arrive 1 day earlier if you reside in MN, ND, SD, IA, WI, or IL. Package MAY arrive next day if you reside in MN or WI. Package will arrive between 1 and 5 days, depending on your location. Grounds shipping times are guaranteed. If you need delivery by a certain date, please select one of the above AIR services. Below is our TIME IN TRANSIT MAP. This map is a general representation of UPS Ground transit times. Package will arrive between 2 and 6 days, depending on your location. UPS SurePost shipping times are NOT guaranteed. If you need delivery by a certain date, please select one of the above AIR services. Above is our TIME IN TRANSIT MAP. This map is a general representation of UPS Ground transit times. To determine estimated UPS SurePost times, add 1 to 2 business days (including Saturday). UPS SurePost uses the UPS for the package pickup, in-transit transfers, and makes delivery of the package to your local post office. The USPS then, on the next business day, delivers your package to your home. This service is only offered to RESIDENTIAL addresses, and for packages 9.0lbs or less. Prices for all UPS shipments include detailed tracking and delivery confirmation service. UPS shipments are guaranteed to be delivered on-time. Please see UPS's terms and exceptions for this guarantee. All UPS International shipments require signature release. UPS can NOT deliver to PO Box numbers. Halifax: 5 days; Vancouver, Edmonton, Calgary, Saskatoon, 'Ottawa, Montreal, Quebec City: 4 days; Regina, Thunder Bay, Hamilton, Toronto: 3 days; Winnipeg: 2 days. Orders to Canada using UPS: UPS will need to collect duties (if applicable), PST, & GST upon package delivery. Brokerage fees are also charged for Standard (Ground) shipping services. Brokerage fees are built into the shipping fees for Expedited and Express shipping services. Be sure somebody is able to receive your package at your "ship to" address, so these fees can be paid and your package quickly released. Call 1-800-PICK-UPS for details. These described fees are NOT otherwise included in your shipping charges. Packages to Canada can NOT be released without signature. Alternatively, you may want to ship your package USPS (Postal Services), as the fees charged by Canada Post are significantly less. Click HERE for UPS "Canada to USA" Brokerage Fee Document. Delivery in 1 business day by 12 noon to most destinations in Canada, and 2 business days to most other world-wide destinations in Europe and Asia. Worldwide Express service INCLUDES the UPS brokerage fee normally assessed for GROUND packages. However, local taxes and duties must still be paid. Due to the nature of international package shipping, UPS can not leave international packages without signature. Delivery typically in 2 business days to most destinations in Canada, and 3-4 business days to most other world-wide destinations. A delivery time commitment is not provided for this service. Worldwide Express service INCLUDES the UPS brokerage fee normally assessed for GROUND packages. However, local taxes and duties must still be paid. Due to the nature of international package shipping, UPS can not leave international packages without signature. Package will arrive between 2 and 6 days, depending on your location. This service is only offered to Canadian destinations. If you need delivery by a certain date, please select one of the above AIR services. We are not responsible for any shipping delays for GROUND services. UPS Standard/Ground service does NOT include the UPS brokerage fee. In addition, local taxes and duties must also be paid. Due to the nature of international package shipping, UPS can not leave international packages without signature. Delivery in 2-5 postal business days, not guaranteed. Recommended for most lighter orders less than 13 oz, where cost is more important the delivery time. Delivery confirmation and VERY basic tracking included. Service not available for packages OVER 13 oz. Delivery in 1-4 postal business days, not guaranteed. 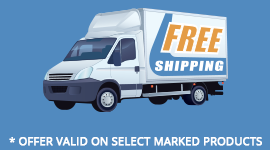 RECOMMENDED shipping service for small, light packages delivered all business days plus Saturdays for packages 2lbs or less. Packages normally delivered in 2-3 days for most customers in major metropolitan areas. Allow an EXTRA day for customers not serviced or near a major metropolitan area. 95% of our orders use this method for delivery. Maximum weight: 70 lbs. RECOMMENDED when you must have your package as soon as possible. Packages are NORMALLY delivered on the next day (6 days a week, including Saturday and for some major metropolitan areas, Sundays). EXPRESS MAIL requests received before 3pm will still ship out "same day", but may not meet delivery time committments. Allow a further EXTRA day for customers not serviced or near a major metropolitan area. USPS contracts directly with FEDEX for the air handling of their packages. Most packages are, however, delivered in 1 or 2 days. We will NOT accept responsibility, nor offer refunds for packages delivered "late" by the USPS. If you absolutely need guaranteed delivery service, please select UPS instead. Click HERE to determine USPS Express Mail Service Commitment for your specific ZIP Code. Orders received before 3:30pm, Monday through Friday (except business and postal holidays) will normally ship same day. Prices for all USPS shipments include VERY limited tracking and delivery confirmation service. Shipments and delivery commitments by the post office are estimates, and are NOT guaranteed. Orders to Canada using Post Office: Canada Post will need to collect duties (if applicable), PST (if applicable), and GST/HST upon package delivery. Canada Post charges a flat $5.00 CDN brokerage service fee regardless of your package value for the brokerage service. Click HERE for more information about these fees, and importing your mailed package into Canada. These described fees are NOT otherwise included in your shipping charges. Delivery in 6-10 postal business days, not guaranteed. RECOMMENDED shipping service for small, light packages delivered all business days plus Saturdays for packages 2lbs or less. Packages normally delivered in 6-10 days for most customers in major metropolitan areas. Allow an EXTRA day for customers not serviced or near a major metropolitan area. 95% of our orders use this method for delivery. Maximum weight: 70 lbs. Packages are NORMALLY delivered in 3-5 days (5 days a week). The post office has a special 10:00am pickup at our location for all its EXPRESS MAIL packages. EXPRESS MAIL requests received AFTER 10am but before 3pm will still ship out "same day", but may not meet delivery time commitments. Allow a further EXTRA day for customers not serviced or near a major metropolitan area. USPS contracts directly with FEDEX for the air handling of some their packages. Most packages are, however, delivered in 3-5 days. We will NOT accept responsibility, nor offer refunds for packages delivered "late" by the USPS. If you absolutely need guaranteed delivery service, please select UPS instead. If you are in the Minneapolis/St. Paul MN metropolitan area, we invite you to our location to pick up your pre-paid order directly. You MUST place your order on-line prior to pickup. Pick-ups are permitted between 8:00am - 5:00pm, Monday-Friday, and 9:00am - 4pm Saturdays. We are CLOSED for most major holidays. Note: If you are placing an order very close to the above noted cut-off times and have requested UPS Air service, we recommend NOT making payment by "Google Checkout", as many times there is a 1-2 hour delay in order approvals for new Google Checkout customers. Please use the DIRECT PAYMENT option instead. We apologize for this "quirk", and Google are working on approving transactions faster going forward.